Handle: Made of Aerospace Grade Aluminum. The surface is treated by anodic oxidation technology and is processed by CNC digital machine that make it reach a very high level of integration and stability. 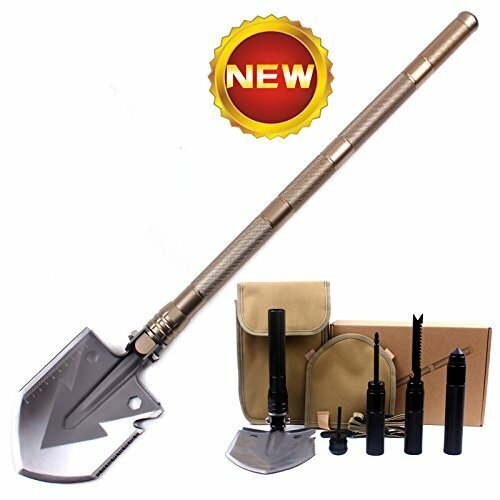 End Handle: Made of Aerospace Grade Aluminum (Tensile Strength: MPa350) SLFC Portable Multifunction Backcountry Shovel delivers the ultimate in backcountry versatility. Click "Add to Cart" yellow button above and get one for your future hiking, camping, backpacking, outdoor excursion and adventures! Multi-function:Compass,digging, sawing, chopping, cutting, picking, prying, hammering, bottle opening, shoveling. PORTABLE- Amazingly compact and lightweight that can easily fit in a small space in your vehicle for snow days or unexpected emergencies. Attach carrying case to belt for easy access. Don't travel without this versatile folding tool! VIRTUALLY INDESTRUCTIBLE- Made with Heat-Treated High Quality SOLID Carbon Steel (Blade and Knife) and Aerospace Grade Aluminum (Knife), for maximum strength and lifetime durability. Go ahead- PUT IT TO THE TEST!